With the snow melting and the sun shining, your senior loved one is sure to want to get out of the house. Although temperatures are still on the cool side for many parts of the country, it’s only a matter of time before we’re enjoying 70- or 80-degree days. 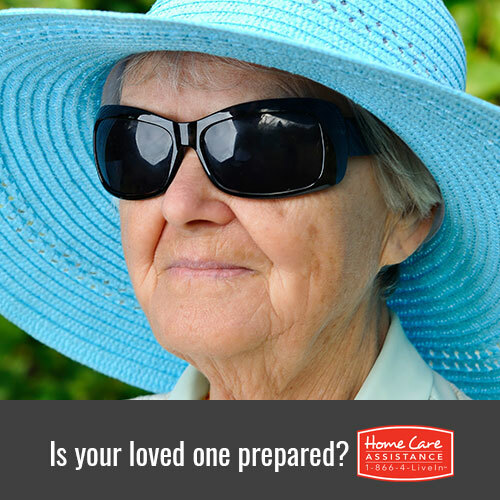 As it warms up outside, it’s important to consider ways to keep your loved one safe in the spring and summer sun. Here are a few helpful tips from trusted Harrisburg home care provider, Home Care Assistance. Make sure to protect your loved one’s sensitive skin from bright sunlight. If possible, have him or her dress in a loose-fitting long sleeved shirt and pants that are made of light, breathable fabric. Apply sunscreen frequently to any skin that isn’t covered, like the hands, face, ears and neck. Most people don’t know that eyes can get sunburnt too! Find a pair of large, comfortable sunglasses that protect against 99 to 100 percent of UVA and UVB rays. This includes sunglasses labeled “UV 400.” The hat will cover and protect the scalp and provide extra shade to the face and eyes. This is especially important if your loved one will be out midday and in direct sunlight. Freeze some bottled water, juice, or sports drinks ahead of time so that they will melt during your outing to provide ice-cold, slushy refreshment. You may also want to bring water-rich foods like fruits and vegetables for extra hydration. These can be found just about anywhere and are usually a very reasonable price. The fit nicely into a purse or backpack, and some spritz water mist for extra cooling. If you are planning on being outside for an extended period, make sure wherever you and your loved one are going has some shaded areas available. Even better, you can bring a large umbrella or parasol for instant shade anywhere. If you care for a senior who is confined to a wheelchair, you may want to attach the umbrella directly to the chair for extra protection. Staying out in the heat too long can be draining for anyone, especially the elderly. Go inside or rest in shaded areas when possible to cool off and recover. It’s easy to enjoy the outdoors with a senior loved one if you simply take some time to plan for the heat. For more tips on senior safety, get in touch with Harrisburg Home Care Assistance. We provide hourly and live-in care, as well as specialized Alzheimer’s and dementia care in Harrisburg. Speak with an experienced Care Manager at (717) 540-4663 and find out how Home Care Assistance can help your senior loved one maintain a high quality of life.